Once upon a time, there was “an integrated kiwifruit orcharding and post-harvest company” called Seeka Kiwifruit Industries Ltd, which ran a pretty tight ship in a sector of the produce industry the business understood really well – kiwifruit. That was not a surprise to anyone because one would expect kiwifruit growers to understand everything there is to understand about kiwifruit. And if there was something about kiwifruit the kiwifruit growers who owned the orcharding and post-harvest company did not understand about kiwifruit, they could always ask the good people at Zespri who understand the marketing aspects of kiwifruit really well. Because unlike the orcharding and post-harvest company, Zespri really understands everything there is to understand about dealing with kiwifruit retailers and their needs, demands and quirks. Being a kiwifruit grower has had its ups and downs in recent years, but the kiwifruit orcharding and post-harvest manager in question sought NZX listing and developed a strategy which can be found on its website. The strategy says that the company wants to be “New Zealand’s premier produce business”, and that “developing complementary business” will add to the company’s prospects for future growth. As one would expect from a kiwifruit orcharding and post-harvest company, it already packs a complementary crop, avocados, and the 2013 Annual Report states “limited volumes of Kiwiberries will be handled…in 2014”. No big surprises so far – and the fairly ambitious statement about wishing to be the country’s premier produce business could be seen as a bunch of Bay of Plenty growers having gotten carried away at a strategy & vision session. 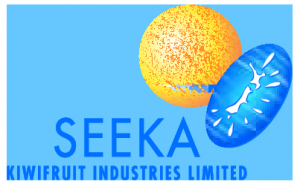 “Seeka Kiwifruit Industries Limited advises that it has agreed to purchase Glassfields (NZ) Limited“. Did I get this right? A kiwifruit orcharding and post-harvest company is buying a banana importer which exists at the grace of Countdown? Apparently, I did understand correctly. The purchase was completed on 17 April. A small step? I don’t think so. 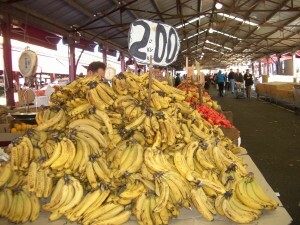 Bananas are the ultimate big league product. Kiwifruit are important to the extent that we manage to fill whole reefer vessels here in New Zealand and send them to the world’s markets. 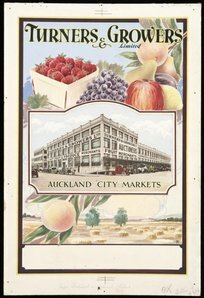 But within the context of the global fruit trade, Kiwifruit are one of many ‘also run’ sub-tropical products on offer on the world’s fruit & vegetables shelves and any supply issues or disruptions at store level is at best of nuisance value. Woe behold though, if a supermarket experiences a banana supply problem and be it ever so small. Produce shoppers judge the state of the whole produce department on the quality of the bananas for sale and any deviation from the norm in terms of volume, ripening stage, shelf life or size will lead to pretty hefty “Please explain” requests being issued by agitated banana category managers, and depending upon the severity of the deviation, more senior supermarket managers will fairly rapidly become involved as well. An attention level not afforded to Kiwifruit, Avocados and Kiwiberries I might add. I am sure Countdown doesn’t think that step is all that small. Although Countdown has started to diversify its banana offer in recent months, Glassfields was after all started to facilitate the supermarket’s ability to break free from having to purchase bananas from the global brands such as Dole and Bonita and their local supply partners. Glassfields manages the logistics of getting Countdown’s Gracio bananas (a Sumitomu brand) into the country and into the retailer’s stores. ‘Manages’ as opposed to buying, as Countdown has a direct supply relationship with Sumitomu, as well as with its new Ecuadorian supplier, of course. So – whilst the whole banana supply scene has become more diversified as the result of advances in container shipping technology and practices, I would still call it a bold step for a kiwifruit orcharding and post harvest company to leapfrog to banana ripener and distributor status in its quest to grow, diversify and secure its business. 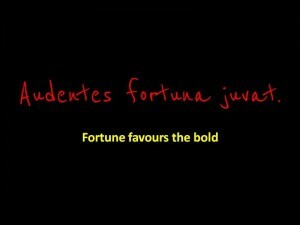 One can only wish Seeka well in their endavour. By the way, did you figure out why the story is entitled ‘The Winter’s Tale’? You might want to check this page. The first paragraph will suffice. Posted: April 28th, 2014 under Bananas, Kiwifruit, Produce Companies, Supermarket - produce. If In Doubt, Chuck It Out? I still have waste on my mind. There is a country where 1.4 million bananas are wasted every day – as well as 1.5 million tomatoes. 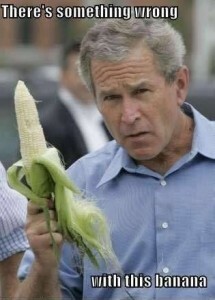 But let’s stick to bananas. No, it is not us. The country in question has a few more people living in it, 63.23 million to be precise, not counting Channel Islanders. If it were us, in purely numerical terms and all things being equal, a population of 4.5 million inhabitants would then be wasting just under 100,000 bananas a day. A scary thought. 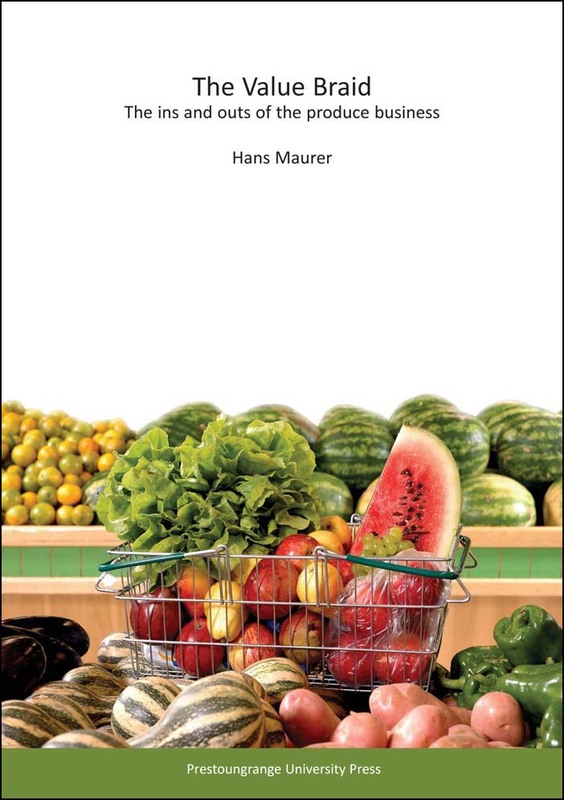 And in case you think I might be making the numbers up, here is the link to the Executive Summary of a UK report on Food Waste published in 2012 . Before I let go of this snippet of information, we might want to consider a couple of other related facts. New Zealand has the highest banana consumption rate per head of population in the developed world, so we might actually be wasting a few more. Our And – our British cuzzies have been working actively at reducing food waste since 2007. That year they chucked out 1.7 million bananas per day. I think we can safely assume that we comfortably hit the 100,000 fruit per day mark, don’t you think? The question is – what are we going to do about it? And yes, I do know the gentleman in the picture is not British. But he did have this uncanny ability to get right to the nub of an issue when it mattered, so he is the ideal ‘poster boy’ to keep the waste issue front of mind. Posted: November 11th, 2013 under Bananas. I took the photo recently on the main railway station in Munich. 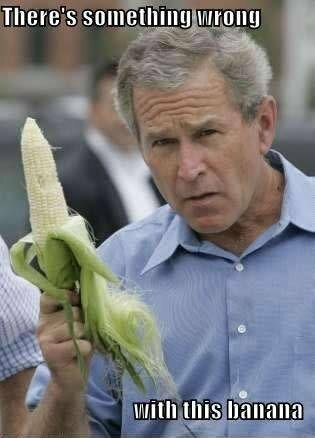 I am digging it out again because I have been contemplating the DOLE position vis a vis the Oxfam report on banana plantation ethics. On one hand, here is DOLE trying to position its fruit at the sustainable/ethical/credible end of the supply spectrum. 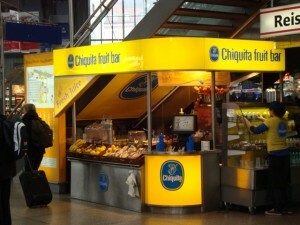 On the other hand, CHIQUITA is busy trying to break out from the produce shelf, aiming its offer direct at the consumer. So at the very least , we need to assume that DOLE has not rushed like a headless chicken into a situation where they issue labels which blatantly provide incorrect information. A more likely scenario is this: DOLE would have over the years invested considerable sums into improving the working environment on the banana farms and through that the living standards of employees. Results would have been measurable, prompting the DOLE marketing department to come up with the label approach. The marketing guys would not have had any qualms about this approach, because they believed the results were visible and the campaign justified. Unfortunately, the discerning first world consumer with a bend towards sustainability, fair trade, political motivation and a transfer of wealth from developed to developing nations cannot agree that the level of positive changes achieved warrant the label and the campaign. Particularly in New Zealand where three vocal people can represent a pressure group which Government is prone to listen to. On any topic…not just bananas. Then there is the small matter that the charity crying wolf about DOLE’s label happens to be supporting a competing banana project… where are the ethics in that? In the meantime, DOLE has done the decent thing and suspended the use of the label. If my attitude towards marketing managers sounds a bit cynical – I remember a Foodtown marketing manager who had a giant guillotine built for a TV commercial. He parked the monstrosity at the top of the Whangaparoa Peninsula cliffs, and filmed cabbage and other unsuspecting produce being chopped in half and chucked down the cliff onto the beach in an attempt to convince customers that produce prices had been permanently reduced…Needless to say, the campaign was a total flop. And I will, by the way, read the Oxfam report and comment more in due course. Posted: May 30th, 2013 under Bananas, Observations, Thoughtpieces.